4,4,5 - 4,5,5..........Bingo von Ellendonk. 4,4,5 - 4,5.............Cona von Niederkassel. 2002: 96-80-85 = 261 points (23rd). 26/08/2001: 88-91-88 = 267 points. 07/04/2001: 100-93-93 = 286 points (1st). 06/04/2002: 100-97-95 = 292 points. Curd von der Urftquelle was the FH Tracking Champion of Westfalen in 1997 with 99 points and competed in the D.V. Meisterschaft in 2002. He also passed the Körung 'for life' with highest rating for hardness, courage and working drives with middle sharpness. 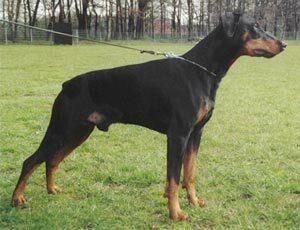 His sire, Doberwache's Amatzon, was a qualified SEK (SWAT) Polizeidiensthund and his dam, Ohra von der Weyermühle, passed the Körung with Körklasse 2B rating. Curd's paternal grand-dam, Kleo von der Weyermühle, was the winner of the working IDC World Championship in 1996 and his maternal grand-sire, Hertog Conan van Manensheide, was the winner of the D.V. Meisterschaft in 1993. Quint: SchH 3, IDC-WM participant and passed the ZTP with 1A rating for character and SG for conformation.